We can feel our breath bouncing back against the masks we’re wearing. It is unnerving, the feeling of our own breath, and comforting at the same time. As if everything about to happen outside the mask is not part of our world, not even a part of the fabric of reality, only a lovely dream. We kick through the doors. It’s easier to do than we thought. The wood does not fight us, does not hold its position as a protector, a barrier, a shield. It bows and tears itself as if it had turned to paper by its own will, ripped and scattered to the wind. As if to say – hey, I’m on your side. The sound of the splintering wood reminds us of campfires and marsh mellows and ghost stories. We shine our lamps under the chins of our masks and stare into the darkness. Inside, hallways snake in different directions, chandeliers struggle to catch the light of our lamps, the golds and crystals glinting and winking at us, as if they know a secret. As if to say – hey, go that way. We split up – down one, two, three hallways. We are linked by our radios, our video, our hard drives – we are together. Always together. At the end of one hallway, the kitchen is all polished metallic cabinets and hardware, a glass or two knocked over and shattered, frailty among all the hardness and glistening cold. Down another hallway are bedrooms, a baby room with a bloody handprint on the edge of the crib, a little boy’s room, tiny soldiers linked arm in arm on his dresser, their green plastic hands gripping green plastic rifles, ready to go to war. The soldiers remind us of ourselves and we smile behind our masks. A teddy bear lies smashed in the middle of the floor, one eye popped out, cotton running in a delicate wad around its mouth. We remember our own bedrooms, toys broken, tears streaming down sugar-caked cheeks. In the master bedroom, the windows are cracked in several places around bullet holes in the glass. A few more bloodied handprints on the wall, one upturned dresser drawer, lingerie scattered across the floor. A facet is still running in the sink, a soothing and unsettling sound. We reach out and shut it off. That’s the kind of people we are. At the end of the last hallway is the garage. The corpse of a bodyguard slumps against an old refrigerator, which hums pleasantly, a noise that reminds us of lunches at grandma’s house, Thanksgiving leftovers, the jingling of cold beer bottles. Another bullet hole in the garage door, blood splattered on a magnet from a national park that probably doesn’t exist anymore. We all gather at the edge of the garage and peer out through the backyard. The fence is bent and flattened, so the yard goes on and on, through trees and bushes. A raven squawks far off, and it reminds us of the Edgar Allan Poe poem, our high school sweetheart, your face after you killed our friends, our loved ones. Your face, all of their faces. All the same faces. We can hear you running through the brush, the cries of your children. Children are never quiet when they’re supposed to be. We walk calmly into the brush, into the shade of the trees. The fall leaves glide down as we bump against the trunks. It’s a pleasant feeling, being among fall colors. We’re at peace here. You’re running hard but you are no match for our serene marching. We find you in a small clearing, yellow leaves gathered around, your baby crying, your little boy tugging at your sleeves, your wife barely breathing, limp on your shoulder. And we open fire. Because you said please. It was very polite. This could have lasted all evening. If we were that kind of people. The sound of the shots echo through the forest, bouncing back and forth against the tree trunks, just as our breath bounces back against our masks. Not us, but us. Not real, but real. This is the end, and the beginning. We lay down in the grass next to your body, piling yellow leaves around your heads like crowns. We lay there, our masks smiling up at the blue sky through the trees. This was a good job, we think. We’re nearly done, we think. This is the start of something great, we think. Across the country, more of us are doing the same to the same kind of people. “I wonder…” says one of us. The words go straight to the sky and do not echo. A raven calls out, as if finishing the sentence. One of us is wondering if this will happen to us one day. 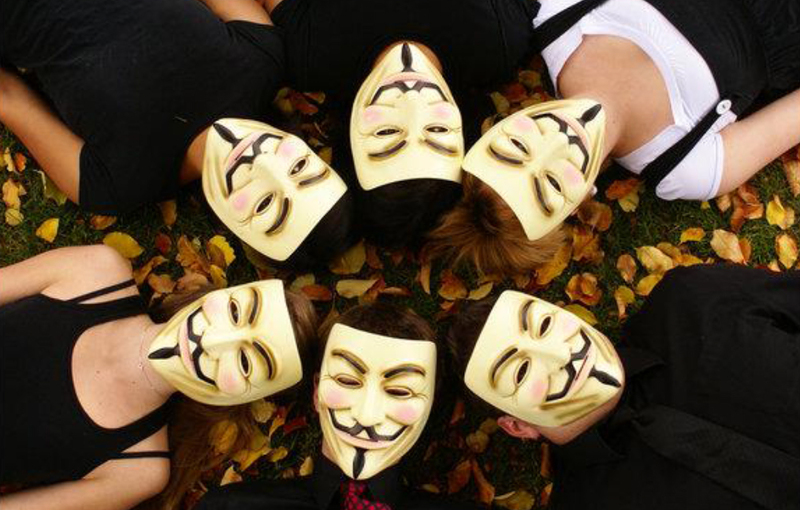 If revolutionaries in masks will raid our homes and hit the reset button, start the game over in their favor. It’s happened before, after all. It’s happening now. One of us stays in the clearing when we leave. We do not give them a choice. We put a crown of leaves around their head as well. It’s only fair. What a powerful a date terrifying story. I feel queasy and sad… The cycle of violence, the monster in the humanity. Wow. This entry was posted on April 21, 2015 by Eclectic Voices in Fiction and tagged april challenge, Chelsea Sutton, fiction, prose, Short story.